The lentil is probably the most common and best known of all the edible legumes, together with dry beans and chickpeas. It has been cultivated since antiquity, since about 2000 BC. Its cultivation was known in ancient Egypt, at the same time that Jews, Greeks and Romans were also cultivating it and had already included it in their diet. In Greece, the lentil is cultivated in many of the geographical areas of the country as it is easy to adapt to many climatic types. The lentil is rich in plant proteins containing all the amino acids. At the same time, its protein is low in fat which makes it a healthy substitute for meat. 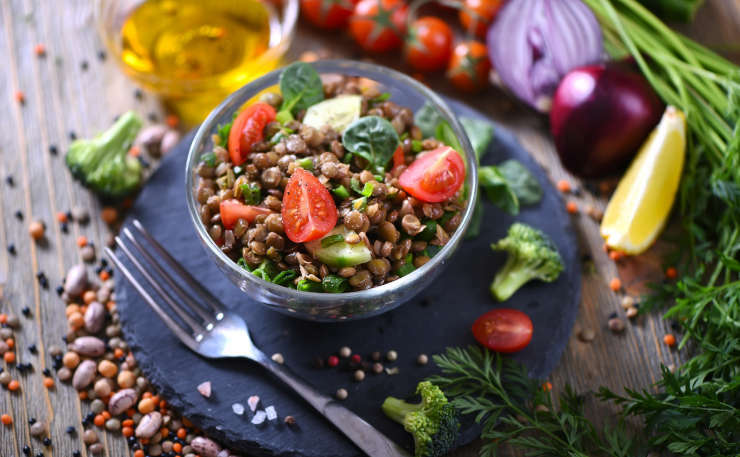 The lentil is also packed with iron which however is not easily absorbed by our body; it is therefore advisable to combine the lentil with vitamin C that helps us absorb it. In Greece we usually consume one type of lentil, none other than the classical brown, medium sized type. There are, however, 13 or more types of lentils. Among those, we distinguish the French green lentil, black or beluga, yellow, red (decorticated yellow), golden, dark orange, large Mexican yellow and others. The classic recipe of lentils as a thick soup is delicious and can be made even more interesting by adding chunky pieces of feta cheese or if it is accompanied by a thick country sausage. The vegetarian version of the thick lentil soup is even more special. Add a few drops of Classic Balsamic Cream and chunks of barley rusks! Lentils however, can become the basis for other dishes of special interest. One of these is the Lentils and Rice with thyme and feta but also the delicious Salad with Lentils and other goodies. For the Salad with Lentils, you will need some finely chopped cabbage, a cup of lentils boiled in water with bay leaves and a little garlic, radishes, small pieces of Red Florina-type peppers pickled in vinegar, sun-dried tomatoes, grated carrots, salt, pepper, olive oil and balsamic vinegar. Some crisp croutons and a few chunks of feta or Katiki Domokou (a white curd cheese from goat’s milk with a soft, slightly sour flavour) will be the finishing touch that will make the Salad with Lentils a real work of Art!